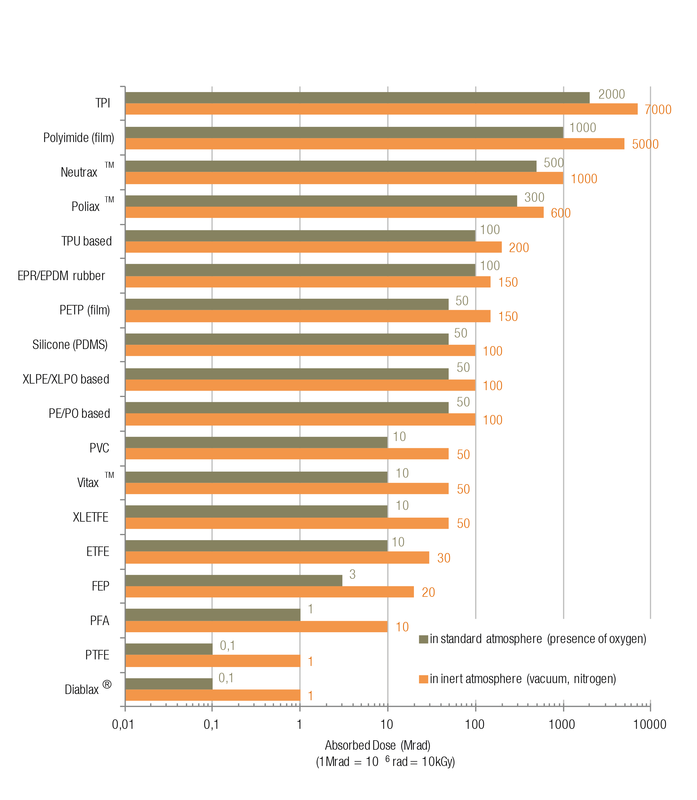 The figure below presents the radiation resistance of electrical insulations exposed to inert (nitrogen, vacuum) or standard atmosphere (presence of oxygen) based on IEC 60544 worst-cases end-point criteria*. These values can only serve as a general guideline ; exact nature of materials (chemical structure, molecular weight, presence and nature of additives) and environmental conditions such as temperature, humidity and dose rate influence the radiation behaviour of materials. Please contact us for more details. *Note: The values does not necessarily refer to an end-of-life condition, especially for materials with high initial strain at break (>200%) including TPU, ETFE, crosslinked or uncrosslinked polyolefins.